I grew up in Memphis,Tennessee playing competitive baseball on a traveling team and living off a good diet of blues and barbecue. I was introduced to the mountains by my grandfather who was a geologist and a world traveler. He lived in Colorado, and after he took me into the mountains for the first time, I was hooked. Over my teenage years, he taught me how to fly fish, ski and pan for gold. Throughout my early twenties I moved around quite a lot, spending time in Alaska and the western United States, developing my mountain skill set in beautiful locations. I was introduced to the Mountain Trip crew by Dave Staeheli, a long time Mountain Trip guide, while working in the Wrangell St.Elias mountains in Alaska. 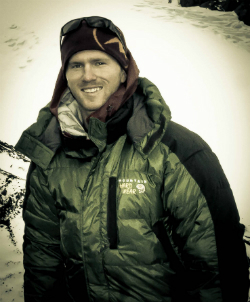 Since joining the Mountain Trip team I have worked multiple expeditions on Denali and Aconcagua. When I am not enjoying expedition life, I spend my time in the Telluride and Ouray region of Southwest Colorado, guiding on the spectacular terrain of San Juan Mountains (snow, rock, alpine and ice). I am very passionate about the mountain education and life experiences that we share with our guests. I feel privileged to get to do what I love for a living.